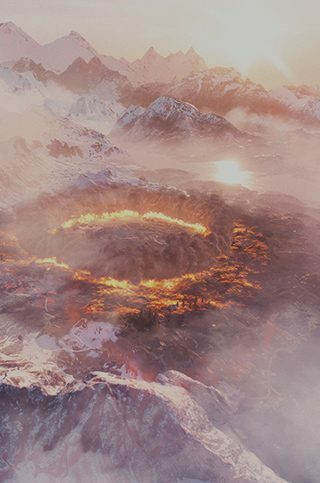 Head to the Firestorm page for the latest on battle royale, reimagined for Battlefield. In Firestorm, combat vehicles like the powerful Panzer tank have now entered the battle royale fray. Getting hold of a tank can give you a great edge, but you won't be invincible – and you need to measure risk versus reward if you challenge other squads to secure the battlefield's most fearsome hardware. Jumping into a transport vehicle will give your squad an edge in speed and power. If you find something with wheels, you can drive it into battle – or plot a quick escape. 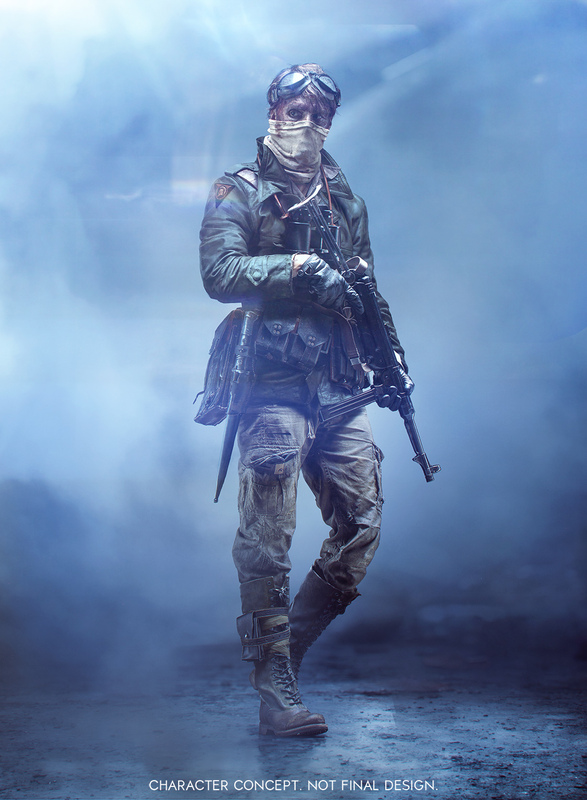 Drop in to the battlefield with a unique tactical loadout by getting the Firestorm Ranger Set and its goggles, light battle fatigues, and MKIII(S) Elite Combat Dagger – the weapon for all encounters as you fight for survival. 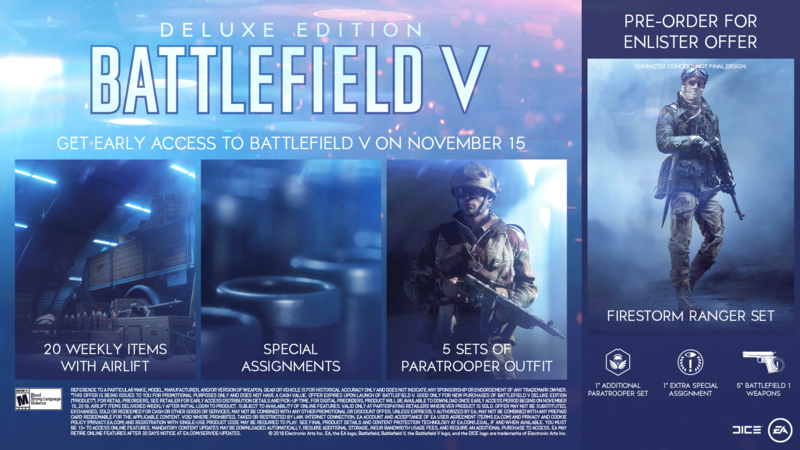 This set is a bonus for pre-ordering Battlefield V and although inspired by Firestorm, it will be usable by players across Battlefield V.
Paratrooper Outfit: Once Battlefield V launches, choose one of eight Special Soldier Sets available in the game to customize your troops. Special Assignments: Earn rewards and get an edge over the competition when you complete Special Assignments. Immediate Access to Five Battlefield 1 Weapons: Unlock some of the Great War’s most modern weapons for use in Battlefield 1, as you bridge the interwar period on the road to Battlefield V.
Early Access to Battlefield V Base Game: Be among the first to dictate the fight and play the Battlefield V base game. 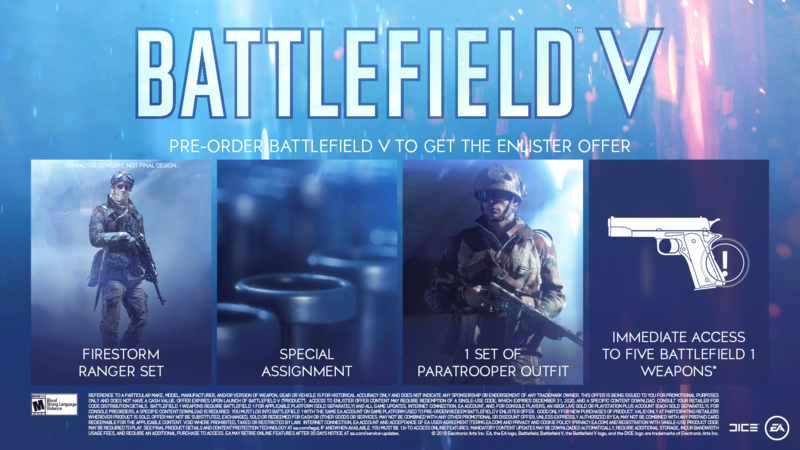 Five Sets of Paratrooper Outfits: Choose Special Soldier Sets from the eight available when deploying as the British Special Air Service or German Airborne troops. Special Assignments: Get rolling with Assignments inspired by the British Special Air Service’s true-to-life raids on German air bases, and ones based on the defense of airfields on the North African coastline by the German Fallschirmjäger troops, as well as Starter Assignments providing more ways to test your skills on the battlefield and earn rewards. 20 Weekly Items with Airlift: Receive vital supplies with 20 weekly Airlifts, each containing one customization item.